Non-gelling means non-clogging. 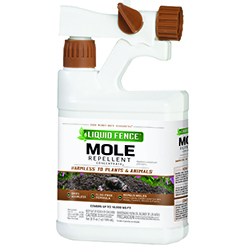 Liquid Fence® Mole Repellent Concentrate2 will keep your hose-end or tank sprayer clog-free. Our repellent is formulated to coat earthworms and grubs, the main sources of food for moles. This creates a very undesirable meal, forcing these destructive nuisances to look elsewhere for food. If mole infestation is high, you may need additional applications. If excessive rainfall occurs after application, causing runoff of product, you may need to reapply.